London: Eden Hazard has fuelled fears that he is to leave Chelsea for Real Madrid this summer by revealing that he has made a decision about his future. The Daily Telegraph understands Hazard has not told Chelsea of his plans, but talks over a new contract have not progressed. It is believed in Spain that Real have given Hazard the assurances he wanted that they will make an offer to sign him. If he wants to go, I think he has to go. Of course, I hope the opposite. I hope he wants to stay here. He has the potential to be the best player in Europe at the moment. That, together with the latest hint over his intentions, has increased the likelihood that he will officially inform Chelsea that he wants to move this summer. Chelsea value Hazard at more than pounds 100 million ($129.6 million), despite the fact his deal will only have 12 months to run at the end of the season. The interview took place around two months ago, but Hazard would have known that it was not due for release immediately. Since admitting he had made a decision, the Belgian has attempted to keep English media guessing and could well continue publicly to keep sending out mixed messages. But friends of the 28-year-old are convinced his mind is made up and the biggest remaining issue appears to be whether Chelsea and Real can agree a deal. 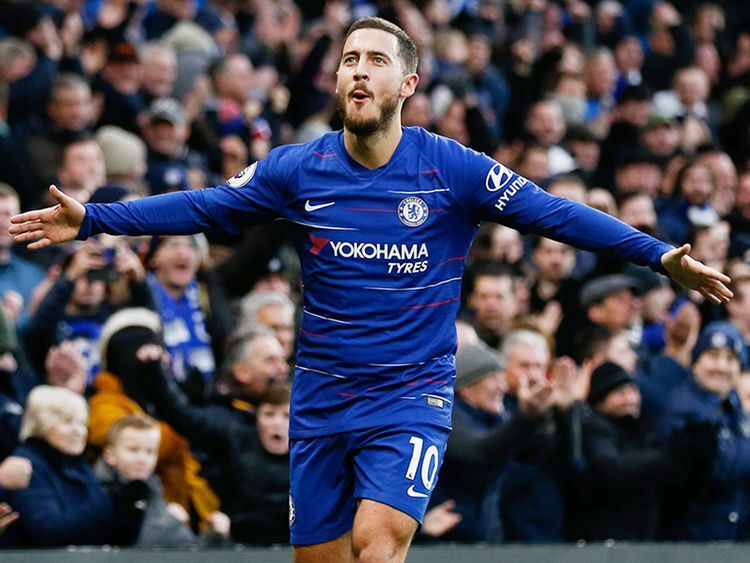 On Boxing Day, Hazard claimed he could wait until the end of the season to decide his future, but that was not taken seriously by those around him, or by Chelsea. It has always been the case that both Hazard and Chelsea have expected to know his intentions early this year, which would be in the interests of both parties. Hazard has been waiting to find out whether Real would follow up their long-standing interest by making a bid. With that promise now in place, he can start to work towards his intended departure. While the news would no doubt come as a blow to Chelsea, it would not be unexpected, as the fear within the club that Hazard would ask to join Real has grown over recent months. Only last week, Maurizio Sarri, the Stamford Bridge head coach, conceded that Hazard should be allowed to leave if he wanted to. Chelsea have reiterated their desire for Hazard to sign a new contract that has been on the table for some time and is worth well over pounds 300,000 ($388,990) a week, but there has been silence from him. Having been backed into a corner by the late departure of goalkeeper Thibaut Courtois to Real in last summer’s transfer window, Chelsea have the chance to use the coming months to plan. There is confidence that if he does go, Hazard will leave on good terms — unlike Courtois — and as part of a mutually agreeable deal. Real could use Mateo Kovacic, who is on loan at Chelsea, as a sweetener in their bid and as a way to bring their cash outlay down. Chelsea already have Christian Pulisic moving to Stamford Bridge from Borussia Dortmund in the summer, but would still look for another big-name replacement for Hazard. One option could be former Liverpool midfielder Philippe Coutinho, who has struggled to make an impact at Barcelona and who has been linked with a return to the Premier League. It also remains to be seen whether Hazard’s potential departure could impact on the future of Callum Hudson-Odoi. Chelsea blocked Hudson-Odoi’s desired January move to Bayern Munich and the winger might reconsider whether he wants to leave in the summer if he believes he has a chance of taking Hazard’s place on the left. On Hudson-Odoi’s future, Sarri said: “I hope the opposite [of Hazard]. I hope he wants to stay and improve. He has the potential to be the best player in Europe and, sometimes, he’s happy with something less. It’s my job to improve him and put him in a position to do his best. “Sometimes that means I have to say something [critical] in the press to do that. It’s normal. It’s my job. “But Callum is 18 and he has to respect the club, the academy, everything. He has time. If you are one of the best young players in Europe, maybe the academy helped you. So you have to respect this.